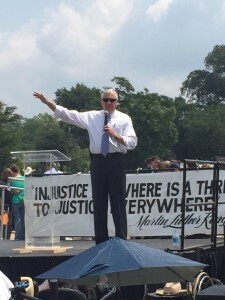 Rep. Steny Hoyer addressing the National Council for Independent Living rally In D.C.
Washington, July 30 – “Yes we’ve come a far way, yes we’ve accomplished much, but we are strong in will to strive to seek to find and not to yield until we get to the real realization of that promise of the ADA and the promise of America,” Steny Hoyer (D- Md) said to applause at a rally hosted by the National Council for Independent Living (NCIL) on Capitol Hill Tuesday. Hoyer has received great acclaim because of his work in the disability community. Twenty-five years ago when the American Disabilities Act (ADA) was in its early stages, Hoyer led the effort to pass the act. Hoyer, who spoke at at least twenty ADA-related events this week, also released a statement through his congressional office echoing this sentiment. Look I am so pleased to be here with you. I was probably with a lot of you last night. Were you there last night? (cheering) Twenty-five years ago, I mentioned a lot of names and people who had been involved, remember that last night. I am not going to mention any of those names, because the people who really made it happen. You know last night was about pride, power, and promise. Those were the three P’s. And I talked about Robert Frost, the road not taken and and the brambles and the branches in front of it, and none of you allowed those branches to get in your way. All of you said, I’m going to make it. I’m going to make it for me, I’m going to make it for my family, I’m going to make it for others, I’m going to make it for those who come behind me. We’ve come a long way, but as every speaker has said, we’re not there yet. We don’t have full access to employment yet. Independent living is a real challenge for so many of us now, so we’re not there yet. So since this is a rally with a lot of speakers I am going to be brief.